Location/ Directions: NY State Thruway (I-287). Take EXIT 14-Spring Valley, at end of ramp turn right on to Rte. 59 West. Bear Right on to New Clarks Road. Make immediate right turn at the next stop light into Spring Valley Market Place. Stay right, follow service road towards Target Department Store, hotel just behind Target on right. 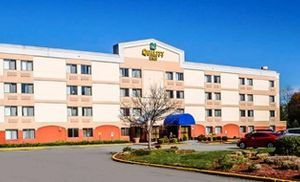 About Hotel: 4-Floors, 104-Rooms, Interior Corridors, Free hot breakfast, Free WiFi, Free coffee, Elevator, No Pets Allowed, Each guest room offers a microwave, refrigerator, flat-screen TV and coffee maker. Free Parking, Hotel adjacent to Shopping Mall. Railroad View: Fair View. All rooms on the rear of the building will offer a railroad view. Higher floors are preferred to see above a fence that boarders the motel parking lot. The solid fence plus some trees and brush along the railroad limit what could be an excellent view of the railroad. You can only see the upper 2/3rd's of the trains. This is not an ideal motel for railroad photo's, but at least you can see what is passing. Windows do open about 4-1/2 inches, protected by a screen. With windows closed there is little noise from passing trains. Thanks to the parking lot lights, you can see passing trains at night, but its not enough light to video. 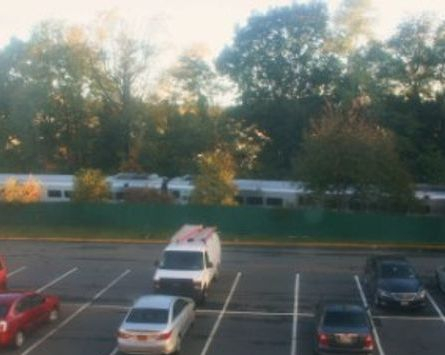 Railroads past Hotel: New Jersey Transit (Politically: Metro-North Railroad, since its in New York State) - Pascack Valley Line. There are only diesel powered commuter trains on this line. No scheduled trains operate on the line between 1:25am and 5:15am. There are 38 scheduled weekday trains and 24 scheduled weekend trains on this line. Notes: This is a former Fairfield Inn hotel. Photo Comment: During my visit I was given a room on the 3rd floor (4-floor motel) on the rear of the motel. I had not complaints as it seems like any room on the 3rd or 4th floor will have a railroad view. 2nd floor rooms may have more of the fence fouling the view. These photo's were taken from room # 312 located in the middle of the building. As you can tell, the solid green fence makes seeing trains from ground level limited. 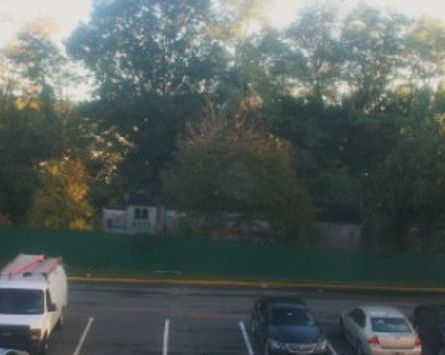 These photo were taken around 8am, the sun wasn't is the best location for photo's from the motel. The glass got washed out a bit in the pictures. I imagine a bit later in the morning the photos would have turned out a little better. The trains in these photo are a sample of all the commuter trains that passed during my stay.